The THLR Calling Shots Card and the Shooter Error Card are for use with the Calling Shots targets. The directions for use are detailed below. Essentially, you simply set your scopes magnification to the point where you CANNOT see the bullets (POI) in the target. Usually 4x – 6x power does the trick. Then you shoot your first serial using the Calling Shots Target (let’s say you choose to warm up with the 1.5 MOA row). You plot hits (“clean” shots) and misses (“pulled” shots) on the Calling Shots card as you go. You then repeat the serial, perhaps at the 1MOA row this time. Once both serials are complete, you go forward and assess the target, assessing whether or not you accurately called HITS (Clean Shots) and MISSES (Pulled Shots). You can then plot the MISSES to compile a “pattern” of missed shots and compare this “pattern” to the identified shot patterns to the shooter error card. The aim of the exercise is to develop your ability to correctly call a “clean” or “pulled” shot which is an important skill. So…you are trying to correctly call 10/10 shots. Although accuracy (and hits) are what we strive for, what is more important is the ability to make a correct call. So…if you only hit 5 out of the 10 targets that’s ok as long as you call the misses. In this situation you could potentially still score 10/10 by calling your shots correctly. If you miss at Long Range it is important to know if the shot was clean or not. If it was a “clean” shot then you know it was likely a poor wind call that caused you to miss. If you “pulled” the shot, you should fire again using the same wind call as it was likely the shooter error that caused the miss. You wind call may have been ok.
One other tip…don’t cheat on this exercise or you get NO BENEFIT at all. 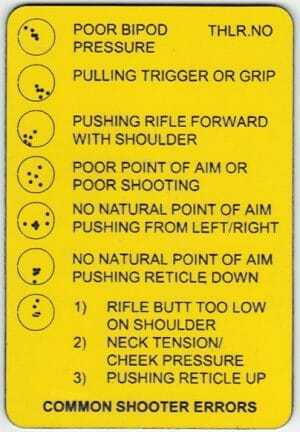 Be honest with yourself and let the target, in conjunction with the shooter error card (see below), identify if/where you are making errors as a shooter. 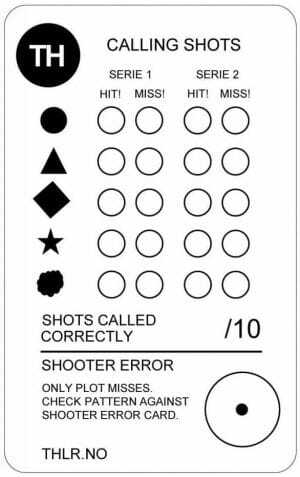 The Shooter Error card is there to assist your to diagnose errors in your shooting form. Obviously the list of potential shooter errors is beyond the scope of a card like this however, the most common errors are identified/addressed. 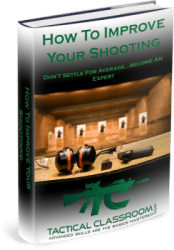 This is especially useful for new shooters or experienced shooters who are returning after a hiatus. Now…the cards are produced by THLR and are available from Vertebrae. For the Calling Shots Card click here. For the Shooter Error Card click here. When I was on the sniper team we conducted a similar exercise regularly because it is SO beneficial. However, we just shot at circles and had to note everything in our shooter log/data book. These cards simplify the process and I highly recommend them. They are credit card sized so take up basically no room in my range bag so there is no excuse to leave them behind.